Terra Cotta Warriors were found in Xi'an, the ancient capital of the first Chinese emperor. They were brightly colored when unearthed but moments later turned to the dark grey color as they appear today. The terra Cotta Warriors and Horses are the most significant archeological excavations of the 20th century. 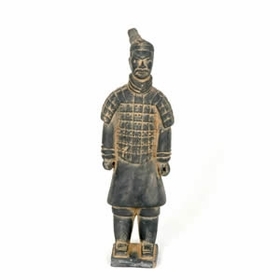 The terra cotta soldier is one of our most popular pieces among our warriors, as they help portray the traditional stance and attitude from over 2,200 years ago. Please note: Currently, this Terracotta Warrior is available for shipment only in the United States. Large Chinese Calligraphy Wall Scroll - Opeing Poem of "Romance of the Three Kingdoms"